The ConceptDraw DIAGRAM provides Mac Tools for drawing SWOT Analysis diagrams. The SWOT Analysis solution includes the SWOT matrix samples and templates that allow users create own SWOT and TOWS diagrams. SWOT analysis is a method of the making plan for evaluate the Strengths, Weaknesses, Opportunities, and Threats involved in a project. It involves specifying the objective of the project and identifying the internal and external causes for the accomplishing project goals. Sample 1. 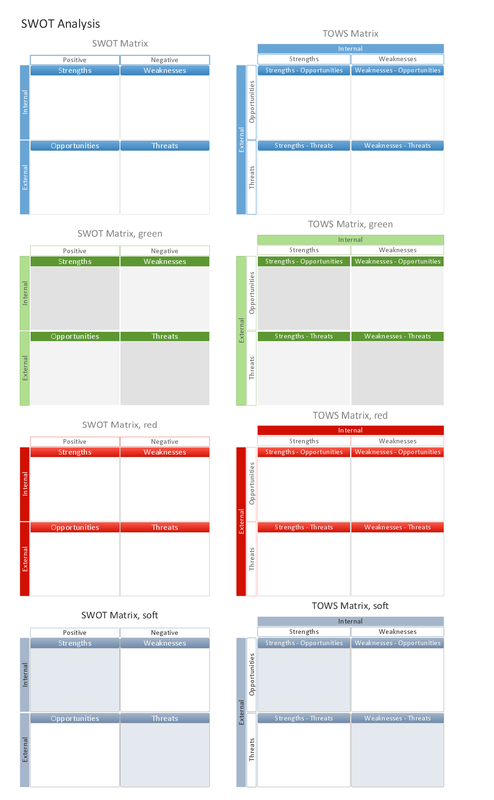 SWOT analysis matrix diagram - Design elements. SWOT Analysis solution from ConceptDraw Solution Park extends ConceptDraw MINDMAP and ConceptDraw DIAGRAM software with easy-to-use SWOT Analysis tools for Mac and PC. This solution contains SWOT and TOWS matrices and mind map templates to be filled in, that help identify Strengths, Weaknesses, Opportunities, and Threats. Using mind mapping to define Strengths, Weaknesses/Limitations, Opportunities, and Threats is a natural fit. SWOT mind maps quickly capture your ideas, and allow you to add and subtract easily, ensuring you don’t overlook any important items.